A stark compare and contrast of life in America and life in Bangkok is the homeless. Or, what is homeless. In Bangkok there are homeless dogs everywhere. They lie in deserted buildings, on streets, in empty construction sites and near the food vendors. The dogs understand city life, they know how to cross the street when the walk sign is on, don’t venture into traffic and know just how to approach a street vendor. In San Francisco, and many major American cities, homeless people are everywhere. They sleep in stoops of buildings at night, beg for change during the day, sell Street Sheets and live off the city and the tax paying inhabitants. Where does your sympathy lie? Do you feel more sympathy for dogs living on the streets or people? When you visit Bangkok is your comment “why are there so many stray (homeless) dogs? And do you make that same comment, albeit about humans, when you visit San Francisco, Seattle or New York? Which live deserves more sympathy for their situation- a dog or a human? Which economy is the more “emerged”- the one that allows people to sleep and beg on the streets or the one that allows dogs? 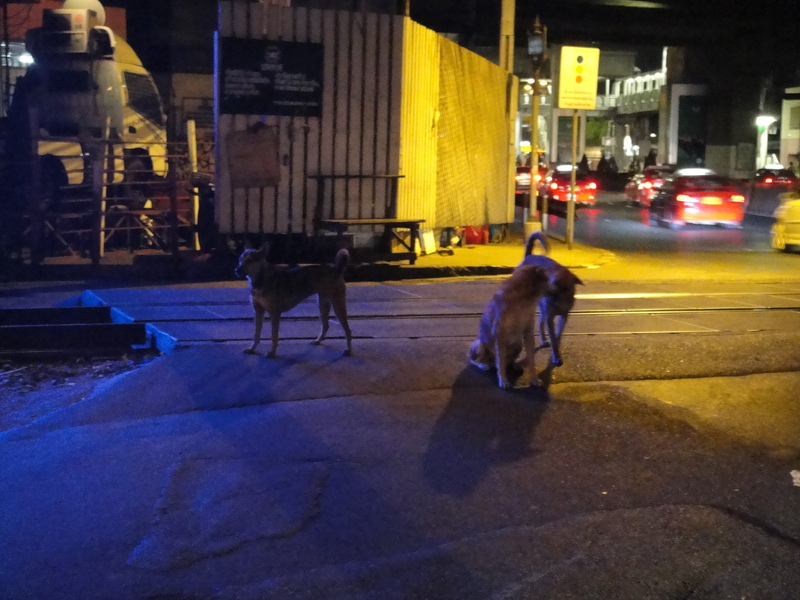 The Bangkok dogs are not cute dogs, you don’t pick them up and cuddle them; these are dogs born and raised on the street that know how to fend for themselves. I have not found them to be aggressive toward people, but they bear the scratches and marks of numerous fights with other dogs. In America the homeless are not cute; sleeping and living outdoors, direct sun and cold weather, a poor diet and usually some type of substance abuse have left them worn down and in need of a good shower. To many westerners, animals hold a special place in our lives- especially dogs due to our association with a dog as a family pet, Lassie and Old Yeller. Oddly, seeing the homeless dogs in Bangkok has not evoked any kind of protectionist feelings from me, I have the sense the dogs are okay, they are such a part of every street block and everyday life, they simply don’t seem unhappy, wandering, lost or unable to protect themselves; they are hot, but not unhappy. After years of walking past homeless people and seeing the same people begging for money and food day after day, my sympathy ran out. What effort is being made to change their situation? Sitting on a sidewalk with a silly slogan written on a piece of cardboard and begging for change? It has always been a challenge for me to explain to Thai people that we don’t have homeless dogs in the USA, but homeless people. That we have rescue shelters for animals that appear to function more efficiently than the shelters for humans; we will adopt an animal that was homeless, but would we hire a former homeless person to work in our house? Are there fewer (only have seen one) homeless people in Bangkok due to the more affordable living costs? A person could live in a small house with limited water and electricity in the middle of Bangkok for almost nothing. You can eat on $2.00 per day. Is the cost of living in the USA what causes the homelessness, or our tolerance and acceptance of a person living on the street? What is my excuse and valid reason we allow people to be homeless in the world’s richest country? This is an example about how different societies view humans and animals. In the USA, we view dogs more as a pet than an animal, and think a dog is dependent upon a human to survive, if they have become homeless it is not their choice and we will try and help them. We view humans completely differently- a homeless person can work to find a shelter, solve problems in their life and return to a more normal life. In the end the homeless are treated about the same- the dogs in Bangkok and humans in San Francisco are largely ignored, walked around and live off the ignored scraps of the cities. It has been said we all die a dogs death, it can also be said we live a dogs life. This entry was posted in Bangkok, Culture, Sightseeing, Thailand and tagged alcohol, Bangkok, beggers, current events, dogs, Farang, homeless, is bangkok safe, new york, san francisco, shelter, stray dog, Thailand, welfare. Bookmark the permalink.